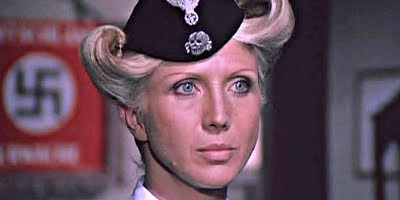 Deported Women of the SS Special Section is a stark, grey and grim melodrama from Werewolf Woman and Hanna D director Rino di Silvestro under the banner of Nazi exploitation. The film features British actor John Steiner who should be considered an honorary Italian at this point, so often has the Englishman transplanted himself for the greater good of genre cinema, as a twisted and merciless Nazi officer who abuses his prisoners and subordinates alike in his relentless search for power…both political and sexual. Dark and depressing colors join forces with solid cinematography from Cannibal Holocaust DP Sergio D’Offizi, while Di Silvestro’s storyline tends to concentrate more upon Steiner’s sexual hangups than the usual scenes of torture, degradation and abuse normally found within these sorts of films. The end result comes across almost as a bargain bin mixture of Tinto Brass’ Salon Kitty and Mattei’s Women’s Camp 119; a highbrow attempt at inserting some storytelling into a genre more comfortable with grimy exploitation which occasionally succeeds…but only for those with enough patience to muddle through some movie misery.